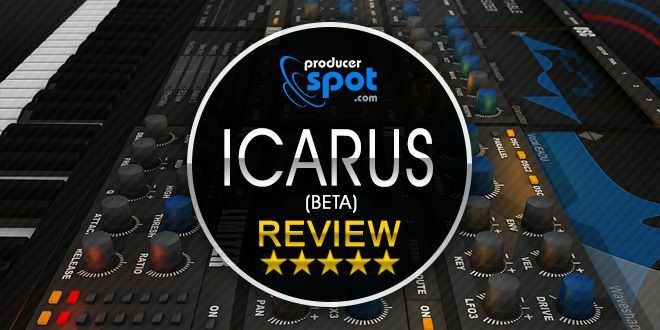 In this review we are going to be going over a new 3D wavetable synthesizer created by Tone2 called Icarus, and to be quite clear from the beginning: it is really amazing synthesizer plugin and Tone2 have done a wonderful job at crafting this great synth. Tone2 have packed so much fun stuff to play in this synth it’s sure to be a game changer as it can do all the classic types of synthesis along with 3d wavetables, Morphing, Resynthesis of samples and Vocal synthesis It has 53 filters, 3 stereo oscillators with hypersaw, Mod matrix, dual stereo filters with 62 filter types, distortion, a vocoder, wavetable editor and an Arp so pretty packed and what’s really amazing is that it is not a CPU hog at all. We can say that this review is an “Exclusive”, Icarus will be available in a few weeks. We tested a beta version, very close to the final version. So let’s get into it at the place where we all start to get to know a new synth the presets and there are allot of them they are neatly organized to patch type with a nice patch browser to get through them all easily. The patches that I have tested so far sound really incredible and do a great job of showcasing what Icarus is capable of. Icarus synthesizer has 3×10 wavetable oscillators meaning each of the oscillators can either play a mono signal or with hypersaw/stereo play up to 10 detuned oscillators at the same time so you can stack up to 30 oscillators for one sound. The oscillators have three view modes to see what your wavetable looks like and how it is moving through the different waveforms as you are modulating them. There are many wavetables included in Icarus that you can choose to load in from the drop down tab or alternatively you can choose to create your own wavetables from samples that you have stored on your computer somewhere. Editing your tables is really a breeze in the editor that comes in Icarus very easy to use and a joy to work with, what I found especially enjoying was the ability to draw in your own tables with your mouse just click and drag so easy to create your own home-made tables. With Icarus you can also resynthesize or vocode samples you have in your library making any short samples you have in your library a source for making new tables. What is really fun in Icarus though is the vocal synthesis being able to load up your own vocal samples and play around with them in the editor and mangling them up is really cool and can bring some really interesting sound design for your tracks. There are quite a few filters to play with in Icarus including multiple types of High Pass, Low Pass, Band Pass, EQ Notch and Peak, Vocal, Phaser, Fractal, Ring Mod, Resampling and sample and hold. You get two filter units to route the signal from the oscillators to letting you choose which oscillator goes to which filter. Both of these filters have multiple ways to modulate them utilizing LFO’s, Envelopes, velocity sensitivity and key tracking this allows you to create movement and variation in your sound with very little effort. Both of the filter units have multiple ways to add warmth or distort your sound with a Saturator, Soft clipping, hard clipping, Rectify, Bit crush, Warp, Wave shape, Ripple and Volume models all of which can also be modulated with an LFO. In Icarus you get four LFO’s three identical LFO’s and a Step LFO of which the first three are set to some fixed parameters like the wave shape, distortion, and the morph knobs but can also be assigned to other parameters using the matrix section in Icarus which allows you to modulate almost any parameter in Icarus giving this synth some great modulation capabilities. You do get a good amount of LFO shapes to play with in Icarus but I do wish that you would be able to “draw in” your own shapes hopefully this can be added in future updates. There is also quite a few FX that you can play with in Icarus with different Reverbs, Choruses, Delays, Phaser, Flanges, EQ’s and all of the saturation and distortion models that were also in the oscillator section giving you a total of 53 different FX to play with in your sound design journey. The FX that is included in Icarus sound and works well giving you all of the FX you would need in a synth and modulating them with an LFO makes for a lot of fun times. The Arpeggiator in Icarus looks pretty simple but it is actually quite smart and produces very useful melodic Arps without much hassle as the algorithms for the Arp that come with Icarus are already quite good, however should you choose to create your own Arps or melody’s you don’t have to worry because with control over the Pitch, Velocity, Play modes, Loop length, Octaves, Chord stacking Dual layers and swing you can get this arp to sing great melodies in no time. The Matrix has three pages to set the modulations that you want for your sound which should be more than enough to play with in your sound design journey as almost everything in Icarus can be modulated. The Matrix itself is very easy to work with in setting the parameters and setting how much modulation there needs to be. At the final stage of the signal flow in Icarus you get the EQ and Limiter. The EQ is nice and simple with a few nice presets to get you going and together with the limiter they work well at doing the final smoothing and polishing of your signal. Tone2’s Icarus is an incredibly versatile synth able to produce awesome sounds in a jiffy and does not need any more processing after it as it has everything it needs to produce finished and polished sounds, to work with it is a simple looking synth on the first impression but it can go immensely deep in no time. The sound quality of Icarus is really good just going through the presets shows you that immediately and there are allot of presets that come with this synth. Icarus is also not CPU heavy at all which is a pleasant surprise just because it can do so much and not murder my PC in the process. Icarus is a must have synthesizer plugin, in my opinion, it has everything you need to produce great sounds it sounds awesome and is packed with effects and modulation possibilities, you will be happy and your computer will be happy so it’s a win-win on all fronts. Great synth! Lots of effects and modulation possibilities. Automatically changes color for different tracks makes it easy to see which track you are working on. Hard to see how much you are modulating a certain parameter, would love to be able to see how much a parameter is being modulated on the knob itself somehow. Would like to be able to draw my own LFO shapes. Icarus is available via Tone2 website for both MAC and Windows in 32-bit VSTi, 64-bit VSTi, 32-bit Audiounit, 64-bit Audiounit and as a standalone software. The Final Release version will contain more and better sounds (over 1000), some additional features and some bug fixes.